Susan Craig Winsberg began her musical studies in her hometown of Chicago at the ripe age of five. Her first instrument was the piano, but at ten years old she discovered the flute, and that soon became her instrument of choice. By the time she was sixteen she had won several competitions and auditions, including the Chicago Symphony Youth Auditions for which she was awarded a solo performance with the Chicago Symphony Orchestra. Susan began her college career at Northwestern University, studying flute with Walfrid Kujala of the Chicago Symphony; then transfered to California where she went on to receive her Bachelor of Music and Master of Arts degrees in Flute Performance from San Jose State University under the tutelage of Isabelle Chapuis Starr of the Paris Conservatory. She has studied, performed and taught extensively throughout the United States, Europe and Canada. Susan currently lives in Los Angeles where she freelances as a performer, teacher, composer/arranger and recording artist. 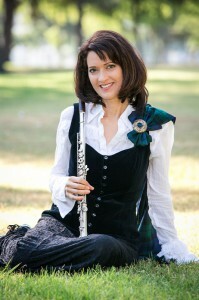 Although her musical training has been mainly classical with some exploration into jazz improvisation, she has in recent years been delving into the music of her Scottish heritage (her mother, Millicent Craig, hails from Hamilton, Scotland), and has expanded into playing traditional wooden flutes, pennywhistles and recorders. Susan’s four CDs demonstrate this instrumental versatility, with Blackwaterside being performed all on modern flutes, and La Belle Dame and Celtic Love Songs on modern flutes, traditional flutes, whistles and recorders. Susan has always been an avid reader of poetry and literature and has recently begun setting several of her favorite poems to music. Three of these “poem-songs” have been recorded for her album La Belle Dame (named after John Keats’ poem “La Belle Dame Sans Merci”), and one, a William Blake poem, on Celtic Love Songs. Her most recent recording, Blythe and Merry, captures her long-tenured group Blackwaterside live in concert. Her other interests and talents include acting, foreign languages, yoga and animal rescue.